“The student experience is inherently digital. It is up to us whether we play an active role in shaping that experience or not. As educators we can support positive digital practices - those critical, thoughtful, professional and scholarly uses of technology that we know give learners the best chance of success. For many students the relationship with an institution begins online – the quality of information and the experience during initial investigations and the responses to any queries will make an impression. Increasingly institutions are reaching out to prospective students to offer preparatory and open study modules to establish relationships before formal study commences; to maintain interest and facilitate independent learning; to introduce key topics; or perhaps to support widening participation. International students at the University of Glasgow took a pre-sessional English language course in digital English developed by the university’s English as a Foreign Language (EFL) unit. This blended learning course supported students with written English and helped them to make the transition into academic study as well as to develop digital literacy skills. The collaborative and reflective approach used a range of digital technologies and developed valuable academic practices. Read Glasgow College case study in full. Postgraduate arts students at Birkbeck College, University of London have piloted a module designed to address information and digital skills. This has proved particularly valuable for students who may be returning to study after a long break and those who fit study around other commitments. After completing a self-assessment activity in six areas students work on tasks relevant to their chosen arts subject using a range of technologies. Students are entering their MA programmes better prepared and are participating in seminars with greater confidence and skill. Read Birkbeck College case study in full. Online relationships can build commitment and affiliation with the institution, help to develop a sense of community and provide valuable transitional support. Many institutions already offer programmes to help learners make the adjustment from study at school to further or higher education and with comparatively little effort these resources could be adapted to suit a wider audience. The learning technologies team at Southampton Solent University has been collecting interviews from students describing successful study skills advice and strategies for blended and distance learning. Some of these have been re-purposed as support materials for other students which are available via text, video or audio. Read Southampton Solent case study in full. Offering a pre-induction online community will help students get to know each other. Providing virtual campus tours and self-diagnostic quizzes can help students prepare for higher study. Giving guidance on recommended devices, the software and services students can expect to use during their course of study and explaining how technology will be used in the curriculum will provide clarity and establish the expectation that digital activities will feature in the overall learning experience. Showing students how to develop a positive public digital identity will help to establish safe and ethical working practices and build confidence. Establishing use of an e-portfolio or other means of recognising and promoting achievement, and where appropriate publishing work as a digital or live Curriculum Vitae, from the outset will also help to establish a professional profile. Treat the signing-on to your institutional systems as the foundation block that will support students throughout their whole learning experience with you and consider rewarding their progress in doing so with badges, credits or some other recognition. The University of Ulster offers students the opportunity to work towards the Engagement Development Graduate Employability Award known as ‘The Edge Award’ to help students evaluate their digital literacies and reflect on their digital identity. To achieve the award students complete four activities amounting to approximately 30 hours of study including a workshop, self-assessment activities and support to develop customised to meet their digital literacies development needs. Read University of Ulster case study in full. Not all students have clear ideas on how digital technologies can support their studies or how they may be important in their lives beyond education – a view supported by the Educause Centre for Analysis and Research (ECAR) in their ECAR Study of Undergraduate Students and Information Technology, 2014. Technology is so pervasive in everyday life that ensuring students are digitally capable by the end of a programme of study has to be considered as one of the key employability skills that institutions need to help students develop. First year students studying BA Health and Social Care at Nottingham Trent University complete a year-long digital skills module which starts pre-induction with an online survey to assess levels of confidence. Throughout the year students undertake a variety of authentic digital tasks which vary according to student needs and aspirations. Read Nottingham Trent case study in full. The ‘Get the Edge’ campaign at South Eastern Regional College challenges students to participate in enterprise and entrepreneurship events through a formalised careers programme. The programme is designed to increase the enterprise skills of students and generate employment opportunities by working with industry and creating entrepreneurs through student companies. During induction week students complete an employability module, which enables them to develop their digital literacy skills from the outset of their course, as they work collaboratively, completing weblogs evidencing their problem solving skills. Materials were available online and used a range of blended learning approaches. Read South Eastern Regional College case study in full. The 2014 UCISA Digital Capabilities Survey identifies the importance of staff digital capabilities as a positive influence on students highlighting the need for staff who are confident and proficient in using technology and designing appropriate digital activities. Threading the use of digital technologies throughout the whole learning experience from pre-entry to induction, to specialised and contextualised use and emerging professional practice will help students become familiar with common workplace practices and embed technology more naturally within personal practice. At South Eastern Regional College the learning academy offers a range of formal and informal learning opportunities for all staff. These include flipped induction (where the training is provided online prior to meeting staff face to face), online learning modules through the learning engine portal, ILT pedagogy mentoring programme, Moodle Monday (online webinars, every Monday, focussed on developing blended learning skills of teaching staff), webinar Wednesdays (‘live’ recorded webinars, each Wednesday, where staff share good practice and social learning via Yammer), which provides ‘just in time’ training. The importance of this modelling approach has helped develop the digital capabilities of staff, impacting positively on the digital learning experience of students. Embedding use of technology throughout the learning journey will help to develop sustainable and robust habits as well as transferable skills. Potentially it will move practice away from a check-list approach of ‘things I can do’ and pave the way for new practices, new uses and a forward looking and adaptable approach capable of accommodating new and emerging technologies. Reinforce the importance of this embedded approach and reflect the potential of technology to have a positive impact on the whole student experience by referencing appropriate use of technology in all relevant institutional strategies. This is likely to include strategies such as: teaching, learning and assessment; libraries and learning resources; data management; and communications and estates. The maximum impact of expanded awareness of and use of technology can only be achieved if this also includes accessible practice and procurement. Our podcast explores how colleges and universities are developing digital literacies for working in a digital world. The traditional approach to skills development by training staff and students separately is a model that is at odds with the fast pace of change and can result in delays in implementing new technologies and new approaches. A more agile approach where staff and students are supported to work in partnership may be more effective. This might help to overcome difficulties of identifying separate time, resources and offer a more responsive approach. An established partnership of seven authorities in the north-east are working together to develop and recognise digital literacy skills for 200 staff who will be supported by a team of digital champions. Both staff and champions will work through the NETSPass online programme, learning how to develop and curate high-quality and effective digital learning resources. The accredited course will use open badges to recognise the achievements of those taking part in the project. Read Gateshead Council case study in full. Lewisham Southgate College have developed an online course called ‘blending in’ that is aimed at teachers to help them to develop blended learning opportunities for their students. This short course introduces staff to the concept of blended learning and is supported by a staff development programme showing them how to use some of the e-learning tools mentioned/used within the course. Read Lewisham Southwark College case study in full. Being Digital: Skills For Life Online is an award-winning interactive resource developed by the Open University comprising a set of 40 distinct digital activities organised into four themes - finding information, using information, creating information, and workplace skills. Each activity takes no more than 10 minutes to complete and users can browse for activities that meet their immediate needs or follow one of several 'pathways'. The resources have been used extensively by a range of students from sixth form to doctorate programmes as well as staff. Read the Open University case study in full. There will still be a need to provide focused and differentiated support, training and guidance for staff as well as for students. Simple approaches like establishing minimum expectations setting out what staff should reasonably be expected to do will guide staff and provide a base level from which customised practice can develop (eg create resources in digital formats, upload resources to institutional learning platforms and adhere to basic accessibility practices). Previously we identified seven elements of digital literacy that were pertinent to both students and staff. This model has been recognised and well-used but research conducted as part of our building digital capability project highlighted emerging issues in ‘data literacy’ and ‘digital well-being’. In our podcast Helen Beetham, leader of the digital capabilities framework project, discusses the increasing importance of digital capabilities and digital wellbeing, and the challenges that these pose to universities and colleges. We have therefore revised the model and framework to show six elements of digital capability, combining ‘information literacy’ with ‘media literacy’ as a result of feedback that suggested users had difficulty distinguishing between the two. Helen Beetham provides further information on the rationale for the revised model on the digital capability blog. 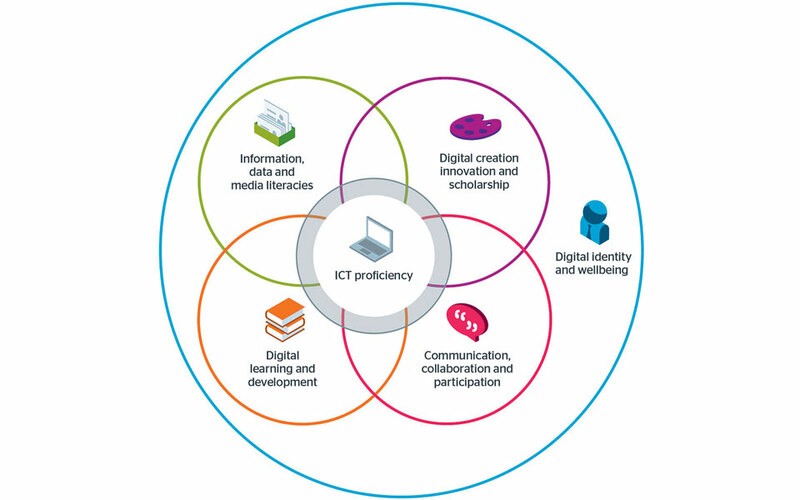 These six elements of: ICT proficiency; information, data and media literacies; digital creation, innovation and scholarship; communication, collaboration and participation; digital learning and self-development; and digital identity and well-being provide opportunities for the contextualised development of personal and professional digital literacy skills. Our quick guide on developing students’ digital literacy provides an overview of the topic and signposts further information and resources, while our our detailed guide to digital literacies provides further resources, support and examples of how others are supporting digital literacy skills development. Staff from the libraries of the universities of Leeds, Manchester and York have worked together with students from their institutions to produce an interactive guide to using social media in learning. The guide covers a range of social platforms and focuses on how social media can be used to enhance learning. Read case studies in full. At Imperial College London a digital literacies course - addressing all seven elements of digital literacy we've identified - has been introduced into the medical curriculum (MBBS) as part of the Foundations of Clinical Practice Theme. Read Imperial College London case study in full. The 2014 UCISA Digital Capabilities Survey identified that students were generally offered greater variety in training, development and accreditation than staff. They recommend that institutions are supported to harness the potential or emerging practices to provide a broad portfolio of opportunities to motivate and reward students and staff positively. “Is our model of tailored staff training and mentoring support affordable? We can’t afford not to do it! You have to get the fundamentals right. Students prioritise relationships with course groups, co-curricular activities, societies and friendship groups (Beetham, H and White, D (2013), students’ expectations and experiences of the digital environment, Jisc) and expect these to be the main focus of their online activity. The contractual aspects of the relationship between students and institutions should be clear but should not dominate digital spaces. Policies such as acceptable use, use of own devices and others should be clearly expressed and readily available along with essential information such as access and response times to faults or queries, what support students can expect and how they can access this. Do your students know how well they are doing? In an environment where greater learner independence is encouraged it makes sense to allow them greater access to their own data so they can better monitor and manage their progress. The Open University is piloting machine-learning based methods for early identification of students at risk of failing. OU Analyse compiles a list of such students and communicates this each week to the module and student support teams to help them consider appropriate support. The overall objective is to significantly improve the retention of students. Allow students to personalise the digital spaces and services they use perhaps including photographs, favourites, friends and followers on their personal dashboard.